At the beginning of this year I embarked on a peculiar, perhaps grossly self-indulgent experiment of trying to listen to all the rock and R&B albums released in the year of 1968--forty years ago--in the order, as best as I could determine, in which they were released. Why 1968? Because it was the year I seriously began to collect albums. I cannot claim that the following list of albums is exhaustive; rather, it consists of those albums I either had or I could easily get my hands on (eBay therefore came in handy on occasion). As might be expected, the experiment prompted me to fill in some gaps in my collection. I sat down over my Christmas break and compiled as comprehensive a list as I could make, then determined which albums I already owned (on vinyl LP or compact disc) and which I would need to acquire. As it turns out, I had a good number of them, although I purchased a few on CD because I wanted the liner notes and bonus tracks. I must emphasize that this list is rather idiosyncratic, neither a "classic rock" list nor an attempt to listen to every pop album released that year. What follows is the order in which I have listened to the albums (with one exception, as indicated). This week, for instance, I have been listening to Frank Zappa's album Lumpy Gravy, which so far as I was able to determine, was released on LP on May 13, 1968--forty years ago this week. Next week I'll listen to Spooky Tooth's It's All About. Predictably, during the course of compiling this list I found that my memory was faulty: I mistakenly had albums released later in the year in the record bins earlier in the year (and vice versa). 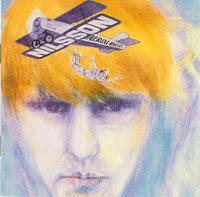 Happily, I must also admit to having discovered a few albums I'd overlooked all those years ago that have now become my favorites--Harry Nilsson's Aerial Ballet, for instance. In fact, I liked it so much I was motivated to acquire his previous album, Pandemonium Shadow Show (1967), which I learned was one of John Lennon's favorites and which has become, four decades late(r), one of mine. While I'd always very much liked Nilsson, I was most familiar with his later albums; I am delighted to have finally given these albums the careful listen they so richly deserve. If any readers have the inclination to correct the information below, or suggest I acquire titles that I've so far overlooked, please don't hesitate to contact me. I'll periodically update the list and correct it, and of course add to it in future blogs. At the end of the month, if I remember, I'll post my June listening schedule. Consider it the aural equivalent of what book stores call a summer reading program. If there is a certain "classic" album missing from the following list, then you can be reasonably certain that it wasn't yet released by the end of May 1968 (e. g., Pink Floyd's A Saucerful of Secrets, released in June, or The Byrds' Sweetheart of the Rodeo, released in July). Please note that some live albums, released two or three years after their original recording (or in some cases, decades later), have been reinserted into the proper sequence to reflect the time they were recorded. These titles are indicated in brackets [ ] after the group's name. Dates reflect US release unless indicated otherwise. Finally, some release dates were determined by the album's catalog number, admittedly not the best way to determine the release date, but a reasonably good indicator nonetheless. Again, corrections and/or emendations are welcome (please provide source of your information if you find my dating faulty). I'll try to post June's listening schedule before the end of the month.